Saint Bernadette Photos - Photos of Glorious Bernadette and the Soubirous Family 1860 to 1858. Saint Bernadette Soubirous large authentic photographs and portraits taken in the 1860's of Glorious Bernadette. St Bernadette Portrait taken in 1858 Authentic by Du Roure. 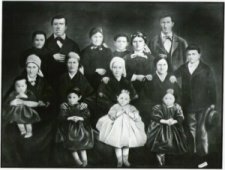 Saint Bernadette Soubirous Family portrait Large 1860's. Authentic 1864 Photo St Bernadette Soubirous. Authentic 1862 Photo St Bernadette Soubirous. Large Card St Bernadette Portrait - 1858 Authentic by Du Roure.